The proposed building for Goa State Pollution Control Board (GSPCB) is located at Saligao, Bardez on a plot admeasuring 4803 sqm. The total built up area of the building which is Ground + Four floors is 6300 sqm. 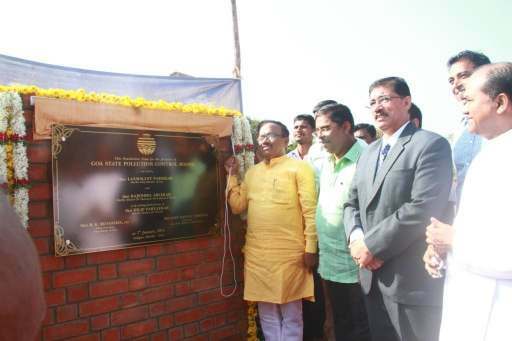 The Foundation stone for this building was laid on 07/01/2016 by Shri Laxmikant Parsekar, Hon’ble Chief Minister in the presence of Shri Dilip Parulekar, Hon’ble Minister for Tourism and Shri Jose Manuel Noronha, Chairman Goa State Pollution Control Board. The work has already commenced on site and this new premises, designed by Architect Gerard Da Cunha, will be complete by November 2016. The ground floor has a double height Porch, Reception, IT Department, Sample Receiving Station, Canteen and Rest rooms for staff and the ground floor has a large atrium of 427 sqm with a transparent roof. The building is earthquake resistant and will have all LED electrical fixtures for power saving. The building has a backup power for all sensitive equipment and computers and the roof of the building will have solar panels which will generate electricity to be used for lighting. Fire protection system is proposed for entire building which consists of fire panels, sprinklers, smoke and heat detectors, internal and external hydrant. Flyash bricks will be used for masonry work. Air-conditioning will be provided only in essential areas such as for laboratory instruments and other scientific equipment as required. The sewage from septic tank and waste water from the laboratory will be treated through soil scape filtration process and used for irrigation purposes.